what made him the unique person he was. I found as time passed that he had as many detractors as fans. Some pictures painted of him were of a vain, arrogant poseur who manufactured “adventures” then passed them off as having actually happened. Other followers were captured and enthralled by his riotous embracing of life itself and frenzied pursuit of Youth. Few occupied the land in between. Clearly, his life was a mystery which begged solving. I made that attempt, had a great time along the way, and feel I achieved my goal. I wanted to share the details with you. William R. Taylor is successful travel, self-improvement, humor, and technical article writer published in over twenty national and regional magazines, he also gave his technical papers at national and international conferences.He completed writing courses from The U. of Wisconsin - Madison, the University of Chicago, Marquette University, and the U. Wisconsin - Milwaukee. He also has an Electrical Engineering degree from Marquette University. He was a design engineer for General Motors on the Apollo project and a design engineer for General Electric on the first CT Scanner. His next book, Twelve Who Dared, deals with courageous men and women who pitted themselves against overwhelming odds then willed themselves to succeed. He has also completed a 76,000 word humor/satire, Max Shulman-type humor novel, The Short Cruise of The La Brea Tirpitz And Other Curious Events or, The Real Truth About Delaware. 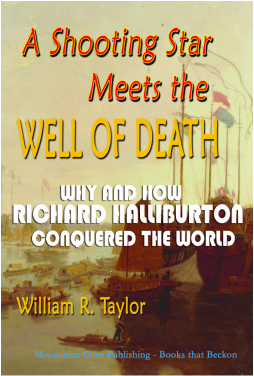 IN T​HESE BOOKS: RICHARD HALLIBURTON at 23 was first to climb Fujiyama alone in the winter - First American to swim the Hellespont - Spent nights in jail with Devils Island prisoners recording their horror stories - Swam the Panama Canal with crocodiles and barracudas - In the early 1930s flew the nooks and crannies of the world in a two-winged, open cockpit plane - Witnessed the confession of a Romanov assassin - Leaped into the Maya Well of Death (twice) - Lived and marched with the French Foreign Legion - But also found the time to fill his best sellers with stories of history, geography, art and explorations.